I’ve had a love affair with Lake Champlain for as long as I can remember. I spent most of my summers along these shores as a child and was thrilled to explore some of the Vermont State Parks in the Lake Champlain Islands this year. 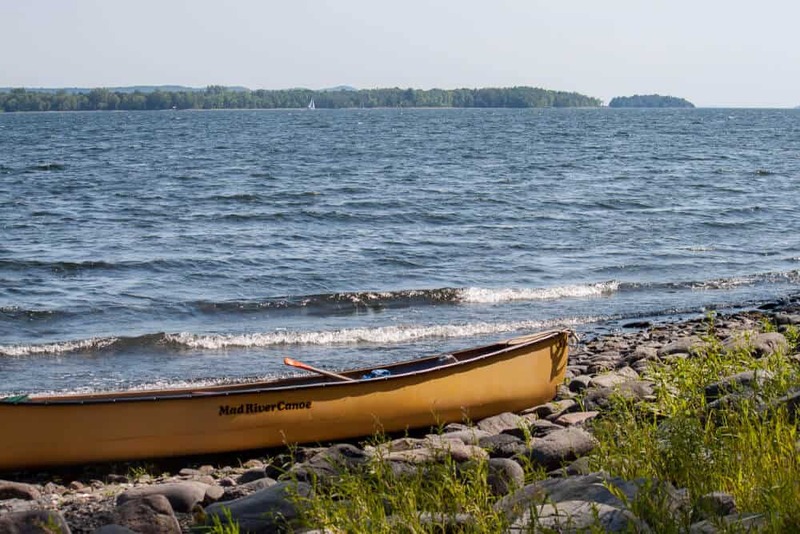 The area in and around the northern reaches of Lake Champlain is home to 10 state parks — and I’m sad to say that I didn’t have time to explore them all. I knew I wanted to visit Burton Island, my all-time favorite Vermont State Park, but I also hoped to check out Woods and Knight Island, which are just a short paddle from Burton Island State Park. Our time on the islands this past summer was one of the most relaxing and memorable of our annual state park explorations. The weather was perfect, the water was refreshing, and as usual, Vermont State Parks didn’t disappoint. 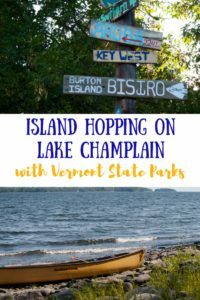 We spent a week exploring four state parks in the Lake Champlain Islands this year – Burton Island State Park, Woods Island State Park, Knight Island State Park, and Kamp Kill Kare State Park. 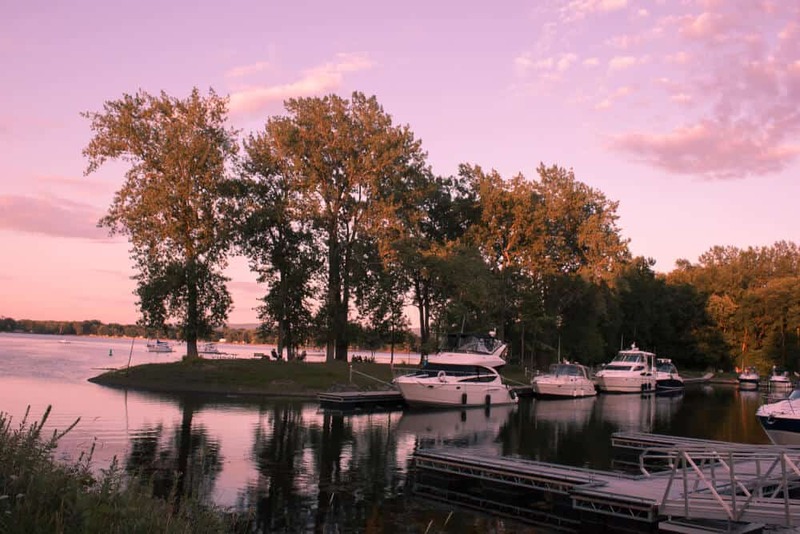 Here are some highlights of our island-hopping adventure on Lake Champlain. 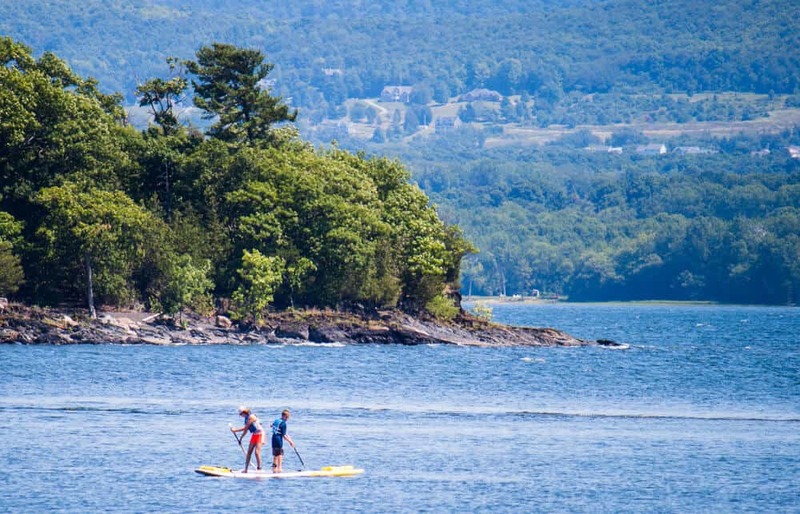 Two paddle boarders exploring off the shore of Burton Island State Park. This lovely, 17-acre state park is situated on a point that juts into St. Albans Bay. It’s a day-use area that was acquired by the state in 1967 as a mainland base to service Burton Island State Park. Kamp Kill Kare State Park has become a destination in its own right, with a large, shady picnic area, an expansive swimming beach, and a boat launch. There’s also a really cool museum housed in an 1870s building that was once a popular summer resort. 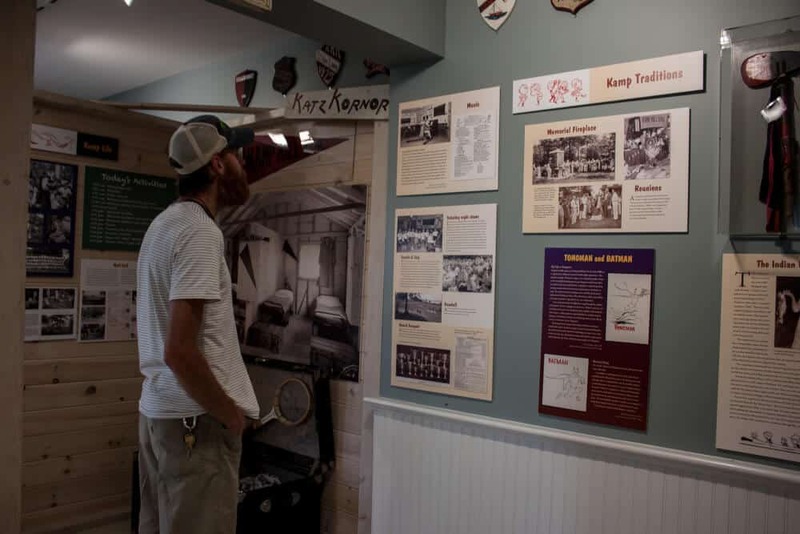 The Rocky Point House Museum documents the history of the land and building, including the hotel era and the rise and fall of Kamp Kill Kare, which was an adventure camp for boys that thrived from 1912 to 1966. Even if you’re short on time, you can pop into the museum on your way to the restroom in the Rocky Point House. The exhibits are quite fascinating and really well done. We loved reading about the summer antics of the campers and wishing we could have experienced the seemingly idyllic adventures that the camp provided. I had to remind myself then and there that I was in the throes of my own magical Vermont summer, and we headed back to the car to unload the canoe. Checking out the exhibits from Kamp Kill Kare. Sounds like a perfect day in the Lake Champlain Islands! If you’re continuing on to Burton Island State Park, you should know that it can only be reached by boat. You can leave your car at Kamp Kill Kare State Park after you check in at the contact station. 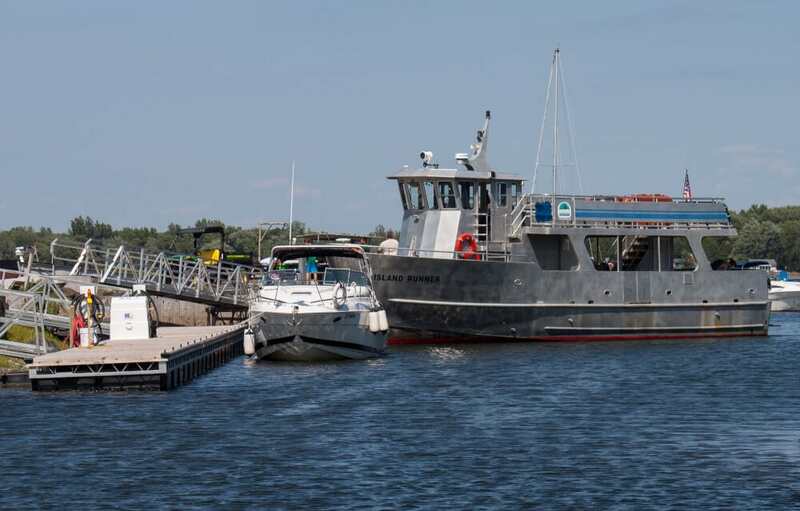 It’s a quick jaunt to Burton Island in a canoe (and even quicker in a motorboat), or you can hop aboard the Island Runner Ferry, which runs back and forth from Burton Island every 1.5 hours throughout the summer. We chose to paddle because we wanted to explore Woods and Knight Islands, and well, we just love adventuring in our canoe. Here’s a current schedule for the Burton Island ferry. The Island Runner Ferry, which runs between Burton Island State Park and Kamp Kill Kare State Park. What can I say about this beautiful island retreat in northern Vermont to encourage you to come? Burton Island State Park embraces visitors like old friends. You can find total solitude at primitive, waterfront campsites, or experience the comings and goings of a lively marina with lots of amenities. There are no cars on the island, so you’ll find lots of free-range kids — running through the tall grass, biking along the trails and campground roads, and yes, even chasing down Pokemon on their phones (there’s WiFi at the marina). 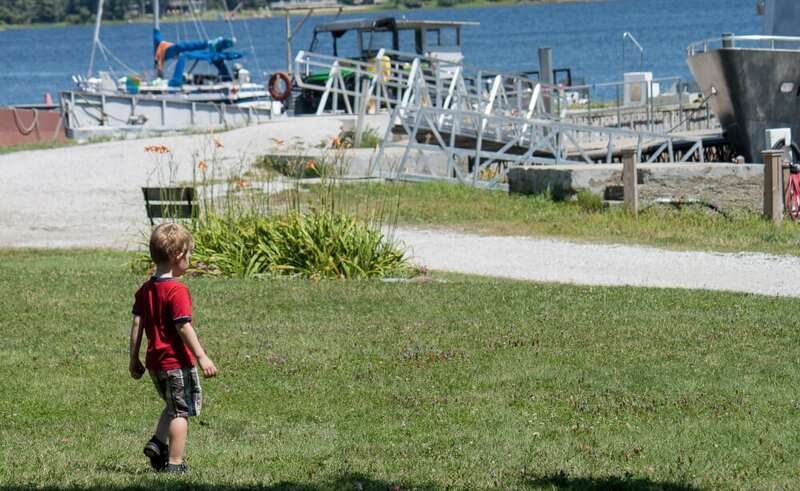 A small child watches the boats coming in and out of the Burton Island Marina. The Burton Island Bistro serves up a fabulous breakfast and lunch, which you can enjoy on the shore with your camping neighbors. They open at 8:30 am and serve fresh, hot coffee to go with the wind in your hair and the smile on your face. They’ve also got a great beer and wine selection — the perfect accompaniment to a Burton Island sunset. For you dog lovers out there, Burton Island has an off-leash dog beach, and all the trails are dog-friendly too. I highly recommend hiking the Southern Tip Trail for sunrise and solitude, and the North Shore Trail for sunset, at least in the summer. As I mentioned before, there are no cars on Burton Island, so you’re responsible for carting your gear to your campsite. There are carts available at the marina for this purpose, and all but the most primitive sites are within easy walking distance of the marina. All of the campsites are spacious and private, but if you want a waterfront site, you’ll have to splurge on a lean-to, and you’ll have to reserve it well in advance (I’m not the only one in love with Burton Island!). We did not heed my own advice during our recent Burton Island camping trip, and we ended up in campsite #6, which was really beautiful, with just a tiny glimpse of the lake through the trees. Recently, brand new camping cabins were built, and they are available for rent on the south side of the island. These, along with all of the campsites on Burton Island, can be reserved up to 11 months in advance. 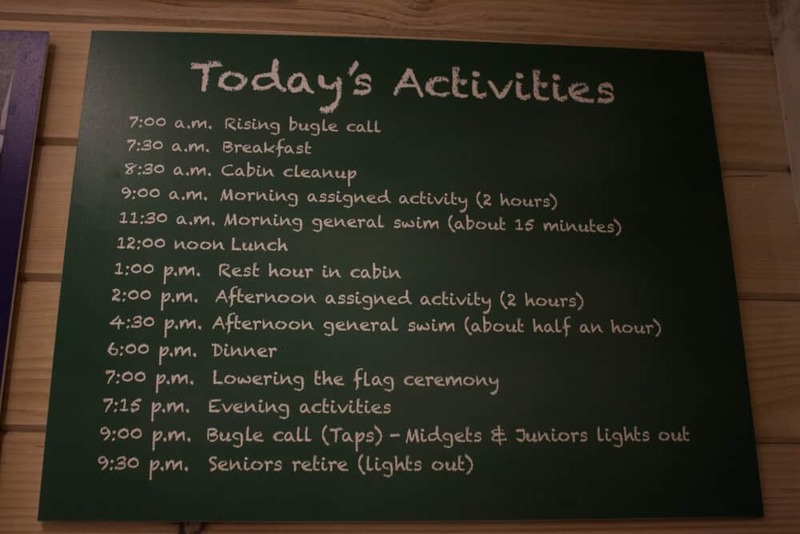 Competition is fierce for the cabins and the lean-tos, so put it on the calendar. After we spent a full day exploring, swimming, and relaxing on Burton Island, we packed up the canoe for an adventure on Lake Champlain. I swooned a bit over the beautiful boats that came and went in the marina during our stay, but in the end, we were more than happy to paddle our canoe into the waves and around the nearby islands. Woods Island State Park is about two miles from Burton Island, and the paddle across took about an hour. This isolated island is home to a diverse ecosystem of old-growth forest and rare plants, plus an abandoned airstrip, and just five primitive campsites. Each site has a fire ring and a privy, as well as the most amazing views. A two-mile trail around the island connects the campsites. 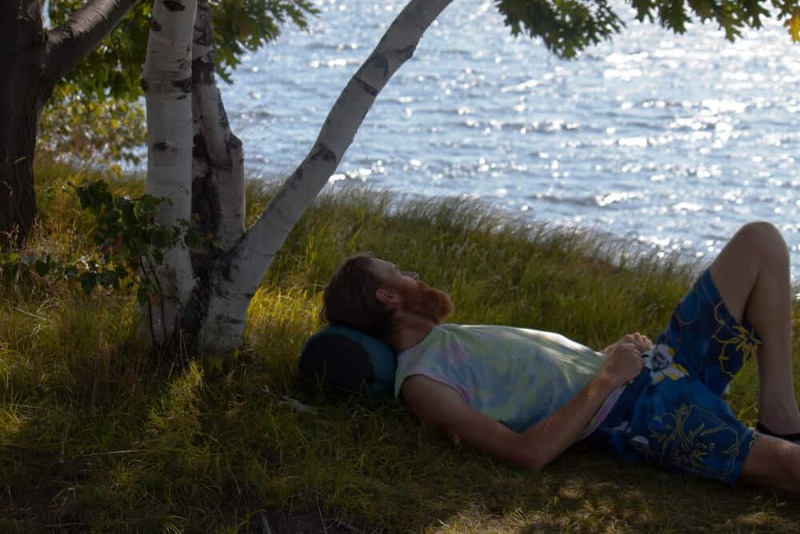 We walked the trail and fell in love with campsite #4, which sits high on a bluff on the south side of the island, overlooking Lake Champlain. There’s good swimming on the eastern side of Woods Island. During our visit, a few boats were moored there, while their passengers relaxed and picnicked on the shore. Eric relaxing near campsite #4 on Woods Island. After another hour of paddling, we landed at Knight Island State Park. Knight is a bit bigger than Woods Island, with a small ferry dock. There are trails that crisscross the island, and seven more primitive campsites. Six of these are rustic lean-tos, each with a composting toilet and again, spectacular views. As you walk along the shore trails, you’ll find towering cliffs as well as sandy and rocky beaches. There are lots of places to swim and relax without seeing another soul. We didn’t spend much time on Knight Island because we still had to paddle back to Burton Island before dark, so after snacking and cooling off in the lake, we headed back to civilization and our bottle of wine that we remembered to buy earlier at Burton Island Bistro. If I can give you one piece of advice for this particular state park adventure, it’s to reserve a longer stay than you think you want. The primitive campsites on Woods and Knight Island are amazing, but the amenities on Burton Island are pretty sweet too. I could go either way, but you know what type of camper you are. If a camp store, Wi-Fi, and firewood are important, go with Burton Island. If you want to be alone, try either Woods or Knight Island. the lean-tos on Burton Island book up very quickly but don’t let that keep you from visiting. The tents sites are just as awesome and more readily available for last-minute vacations. Also, because the lean-tos have to be reserved for 3 nights, there’s a chance that one will be available when you get to Burton Island. Ask the park ranger – maybe you’ll get lucky! The marina at Burton Island State Park. You should also beg, borrow, or steal a boat to help you get around. If that’s not possible, you can always rent a canoe, kayak, or stand-up-paddleboard when you get to Burton Island State Park. Swimming is mandatory, as is relaxing on the shore with your favorite book (or your favorite person). Leave your worries back at the car, and get ready to enjoy everything you love about summers in Vermont. Want to explore more of Vermont State Parks? My goal is to explore them all. Check out our Vermont State Parks archives for more adventures! Island hopping…what a lovely way to have some rest and relaxation. After seeing the pictures, I could picture myself lying on the grass under a tree, beside a lake, staring across at the serene waters. This place has a lot to offer . it could be a great place to explore, hike or rest. I can see why you are in love with it. Vermont had always been on my list of places to visit. With fall upon us, I can just imagine how beautiful it must be. Island hopping sounds like a fantastic way to see so much natural beauty. The parks you suggest all look amazing. I have not spent any time in Vermont~ now I want to go! Looks like my kind of outdoorsy place. 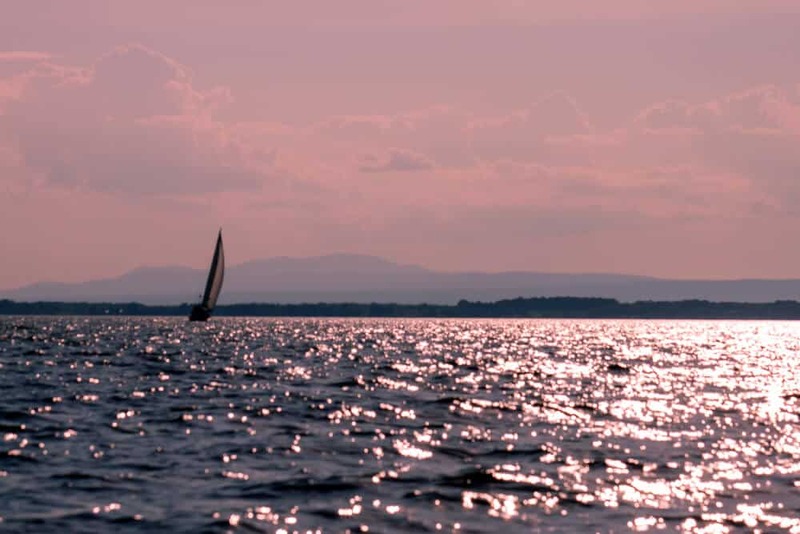 I would love to go camping on Lake Champlain and see the kind of sunsets that you have photographed. Very beautiful! Great tips! My dad took us camping along Lake Champlain when I was younger. Your photos bring back great memories. Fall is probably nice for a visit, too. I love Vermont’s foliage. Lake Champlain, here we come. It looks wow and the time-table is completely packed. I truly enjoyed reading about your outing. I haven’t been but I have been thinking about it. Will probably wait till it gets warmer again. Great photographs, Tara! Burton Island looks like a nice way to explore Vermont. Thank you for sharing your experience and advice! What a nice place! So many things to do and so many parks to explore! I would definitely like to spend a few days there! It was a great adventure and a wonderful vacation. I enjoyed reading about it. 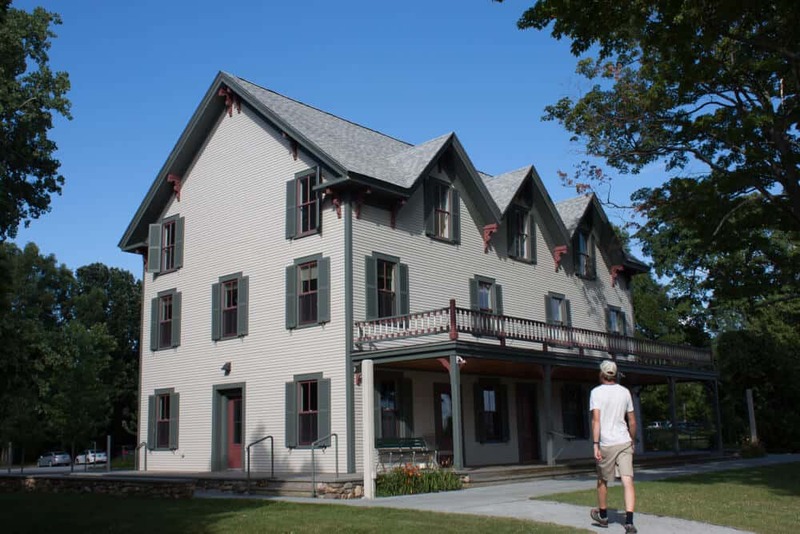 This article has such a great list of options to explore in Vermont! So many family friendly destinations! I must try to get up there with my kids. Thanks for sharing!